How many PMP credential holders are there? You may know that the Project Management Professional (PMP)® is the most important industry-recognized certification for project managers. But, do you know how many active PMP Credential holders are out there? Is the number of PMP Credential holders increasing? Let us find out. PMI Today is a monthly publication from the Project Management Institute (PMI). It keeps the PMI members informed of the latest news, events, volunteer activities and services of PMI and its communities. PMI Today is a benefit of PMI membership and is delivered digitally to all members each month. PMI Today contains a column called PMI fact file, which reports the total active holders of the PMI Credentials/ Certifications. It reports data on all the eight PMI Credentials. But, I just took the number of PMI Credential holders for analysis. I took the PMP Credential holders data from Sep 2014 to Aug 2015, for a period of one year. 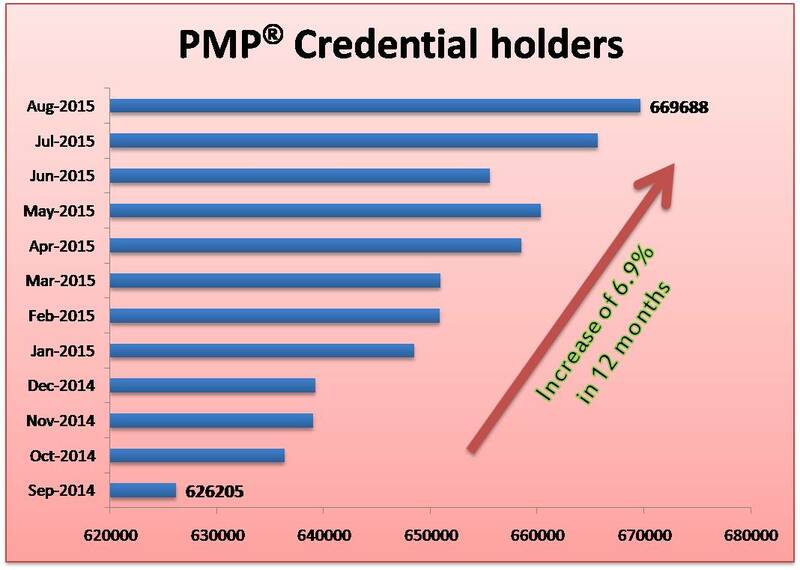 The number of PMP Credential holders was about 626K about 12 months ago. It has increased to about 670K by the end of August 2015. The popularity of PMP Credential and its value is ever increasing and so is the number of people showing interest in the PMP Certification examination. In the past 12 months, the number of PMP Credential holders has increased by about 7%. PMI’s Salary Surveys regularly show increased earnings for Credential holders. The surveys showed that the PMP credential has a positive impact on annual salary. As such, I am sure that the number of PMP Credential holders is about to grow much faster in the next 12 months.